WordPress powers 74 million websites and this number grows every second. CMS is easy to install on any hosting and allows you to control your website via web interface, without any code modification. But if you need a website with more than one language version — you are short on luck. WordPress simply does not have such a feature. In this manual we will review 5 plugins that will help you translate your website into another language. If you need to make a blog in more than one language — install Polylang. It has a simple intuitive interface and many useful options. Users themselves check what exactly they want to see translated — e.g. you can have French interface and English content pages. Polylang supports most of WordPress themes. Source code is open, which means that plugin can be adapted to the user’s needs. WPML will translate everything for you, using online translators. English, German and other Roman languages are almost perfect, but other translations can be a little rough. Luckily, you can proof-read them and fix the mistakes — or just do what we do now and translate everything manually. On the downsides — somewhat illogical dashboard. It will take some time to get used to it. WPML is supported by the most of WordPress themes. Plugin costs $79 for the first year and $29 for every subsequent one. Adding new post with qTranslate installed. qTranslate X allows you to work with all of the versions of the page in a single window, switching between them on the fly. It has quite a lot of addons that connect it with All-In-One SEO Pack, Advanced Name Fields and other popular WordPress plugins. qTranslate X supports 17 languages. Other than that, it is similar to Polylang. Readers that are familiar with the target language, fix the translation. If you do not want the community features, you can disable it and make Transposh a simple multilanguage plugin, similar to Polylang. 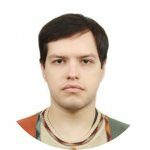 MultilingualPress — impractical, yet curious solution. While other plugins create new versions of each page, MultilingualPress creates several different language versions of the website, located on its subdomains. MultilingualPress works via WordPress Multisite and supports up to 174 languages. Duplicates for the new content are created automatically. Polylang — perfect for small websites and blogs. 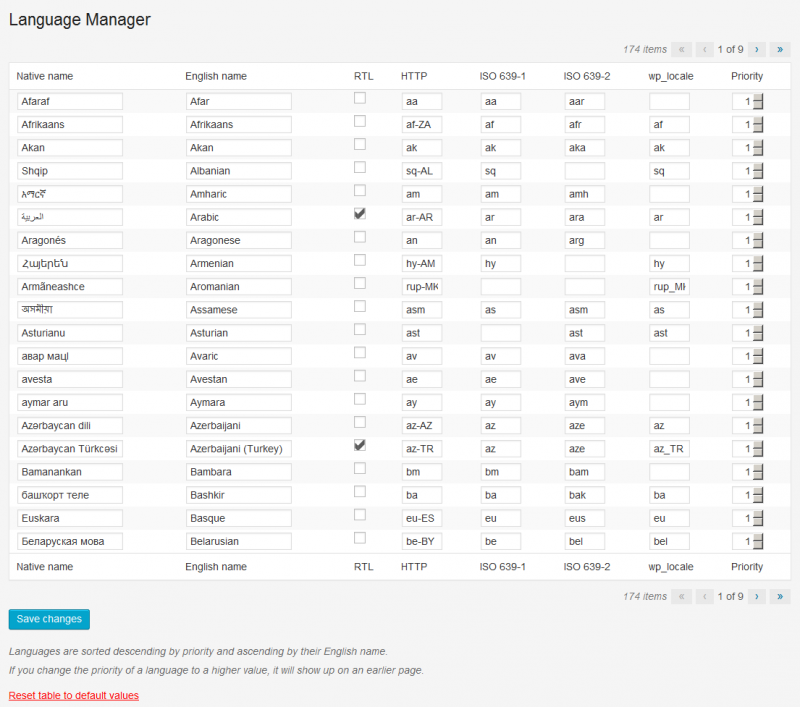 WPML — if you need to quickly translate a website with a lot of content. QTranslate X — very useful if you want to work with content in different languages at the same time. Transposh — suitable for communities that are willing to help out. 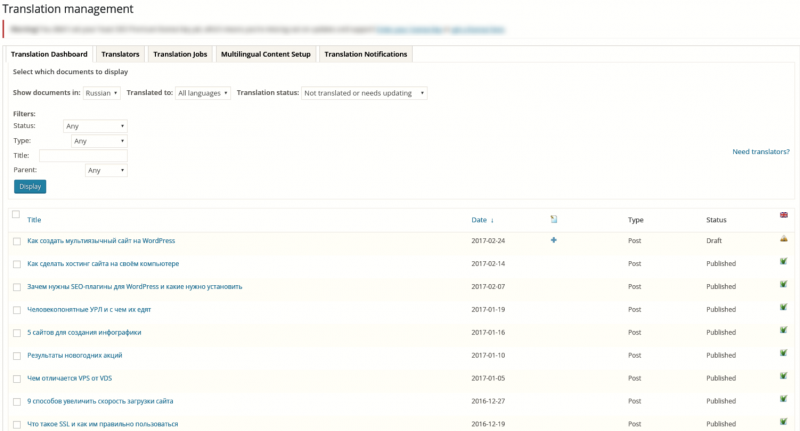 MultilingualPress — points for originality and using WordPress Multisite, but otherwise just a curiosity. All plugins are easy to use and will require an hour at most of getting used to them. So just pick the one that suits you most and start translating your website. Also, subscribe to Unihost blog newsletter and our social network accounts in order not to miss other interesting articles.